Yeah, I might be being brainwashed, but just a little. I know, I know. Michael Moore is a communist. Michael Moore is a big, fat idiot. Michael Moore should just go ahead and move to Cuba if he likes it so much. Michael Moore may just be the Antichrist. 1. You may feel compassion for the woman who lost her husband without a fight because the insurance company and the hospital felt that it was too expensive to attempt a bone marrow transplant that was considered an experimental treatment for his condition. 3. You may wonder if your insurance company could or would drop you from coverage for an undisclosed yeast infection. 4. You may question why a 9/11 rescue worker now on social security because of her respiratory problems that prevent her from working is able to buy her medicine for 5 cents in Communist Cuba when it costs her 20 percent of her monthly Social Security payment in the USA. 5. You may start to wonder if despite following Dave Ramsey’s suggestions to the letter and saving plenty for your retirement you will one day be asking your kids for a spare room because of all of your medical bills. 6. You may wonder how in America someone could lose their 18 month old child because the hospital the child was brought to via ambulance was not in-network with the insurance provider and it took 2 hours to straighten that out and get the child to the “right” hospital just in time for her to die. 7. You may think about how a 35 hour work week and 5 weeks of vacation per year in Godless France may be an easier place to enjoy your family and practice your family values than corporate America. 8. You may wonder why the Al Qaeda detainees at Guantanamo Bay have access to government provided state of the art health care that average citizens and even military personnel could never get without large bags of cash. 9. You may wonder whether it is more effective to help our neighbors by raising cash in a church basement so they can afford a simple test or to change the system so they don’t have to raise that money in the first place. 10. You may realize that Michael Moore and all documentary makers are manipulative with your emotions and distort the facts. France and England are not Utopias. We can’t just turn on socialized medicine and make everything wonderful. 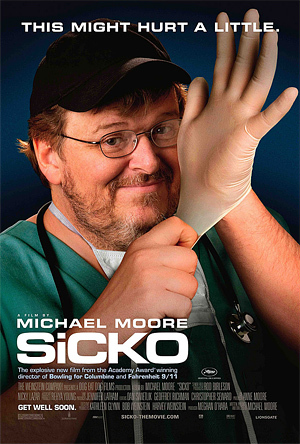 BUT, there is something truly wrong with our health care system and there is a lot of truth in what Mr. Moore has to say. Calling him or those politicians across the aisle the enemy and refusing to listen to them is just burying your head in the sand. Michael Moore may not have the solution figured out, but he’s right that we need to come up with one. Then again, maybe you will just spend the whole movie yelling at the screen about how you’d rather have dinner with Stalin than a liberal democrat like Michael Moore. In that case, you might as well skip this one and spend another night working late to save for your future medical bills.